Within minutes of its first press screening at Cannes word spread that Gus Van Sant’s latest effort had been met by boos and dismissive tweets from senior critics. That seems a little unkind but this soft-hearted muddle of a film does bite off more than it can chew as it tries to combine elements of a survivalist adventure, a re-run of Who's Afraid of Virginia Woolf? and maudlin reflections on love, grief, spiritual matters and mysticism. Like many Van Sant films it is a journey towards self-discovery and forgiveness. 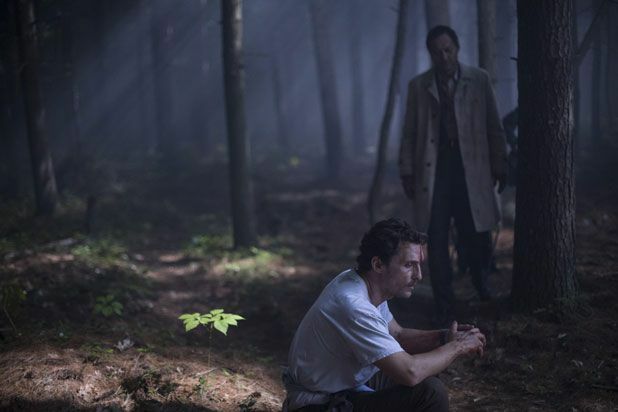 Arthur (Matthew McConaughey) seems intent on taking his own life when he heads to Aokigahara near Mount Fuji, the world’s suicide hotspot. As he strolls deeper into the forest, he meets Takumi (Ken Watanabe) who is badly injured and disorientated. Arthur makes it his mission to keep Takumi alive and guide him to safety. As they endure physical hardships, inclement weather and rough terrain, Arthur reflects on the battlefield of his marriage to Joan (Naomi Watts) and all the regrets and guilt that led him on his pilgrimage to a setting known as the perfect place to die. Chris Sparling, who wrote Buried, brings some clever little touches to The Sea of Trees but struggles to do justice to all the material, settling for banal scenes from a marriage, melodramatic contrivance (alcoholic Joan seems to be the unluckiest woman in the world) and comforting platitudes on love after death. It is beautifully shot by Kasper Tuxen and elegantly edited by Pietro Scalia. There really is no denying the craftsmanship on display here, or the compelling physical and emotional commitment to his character that has become a McConaughey trademark. It is the tearjerker sentimentality that is hard to stomach, in what is far from Van Sant’s finest hour.